About licensing and producing "Lunch at the Piccadilly"
- Lunch at the Piccadilly is a small musical performed on a unit set. 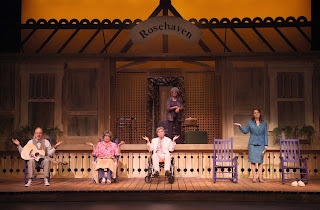 The time is the present, and the action centers on the front porch of the Rosehaven Retirement Home in the fictional town of Listre, N.C.
- There are several other locations - the office at Rosehaven, Aunt Lil's room at Rosehaven, and Lil's room in her house - that are easily achieved with simple design. They may be permanent areas in the set, or they may be furniture pieces that appear as need be. Previous productions have utlilized both designs. - There are two scenes that happen in a car. This may be as simple or as sophisticated as desired. 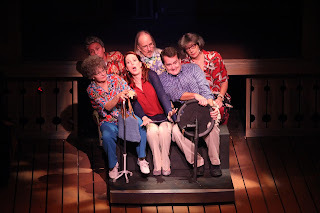 Past productions have accomplished this with plain cubes and a free standing steering wheel that were brought onstage by crew members, as well as more complicated designs with castered platforms and car seats. - Sets for past productions have been both one and two-level. The show is a simple musical to produce. There are 4 roles for seniors (believably 70-75+), 2 roles for younger actors (late 20's to early 40's), and one male character role whose age is flexible. All roles are singing roles, and actors should also be strong vocally and proficient musically, although typical trained voices are not required for some roles. The 20 songs in the show span a wide range of styles from bluegrass to Broadway ballad and are strongly folk-influenced, so "character voices" are appropriate in many of the roles. * The show may also be performed with or without the actor playing Eli Greyson doubling as musician. **If the actor playing Eli doubles on guitar, it is possible to only have 2 musicians (keyboard and percussion). If the actor does not double on guitar, we recommend the production have 3 musicians (keyboard, percussion and a player on standup bass, with one of the three musicians possibly doubling on guitar). Musicians placement is flexible. 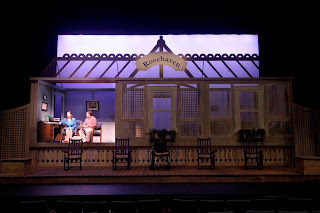 In past productions the musicians have been positioned both onstage with the actors, and offstage. Please email for more information about licensing, quotes, and perusal materials. Please note: Additional materials for production designs and press purposes are also available for licensing. Information about education and outreach projects for "Lunch at the Piccadilly" is also available on request.